Among the most useful materials, metals are also some of the most recyclable materials. 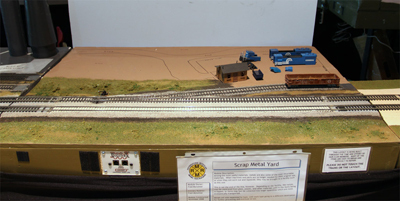 When machines and parts are no longer needed for their original use, or when they are worn out and replaced, they may be brought to a facility such as this one. This is not the end of the line, however. Depending on the facility, the metals may be separated from glass, plastic, and other materials used in the items being scrapped, or items may just be collected into larger quantities which are more economically transported. Metals are also separated by type, with each type going to a different destination for further processing and eventual re-use. For example, iron and steel, which can be separated from other materials magnetically, will be forwarded to steel mills, where they are melted down and re-used in new iron and steel parts. Similar processes allow other metals, such as copper, brass, and aluminum, to be re-used also. 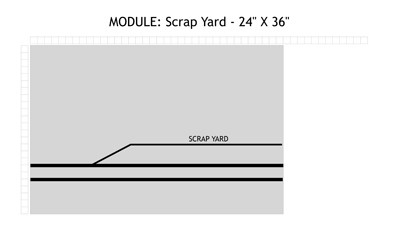 The scrap yard module. The siding is in place, but additional scenery is needed.